The journey from Brighton, situated in England and Edinburgh, which is in Scotland is well served by trains. The trains are operated by the following rail companies: Gatwick Express. 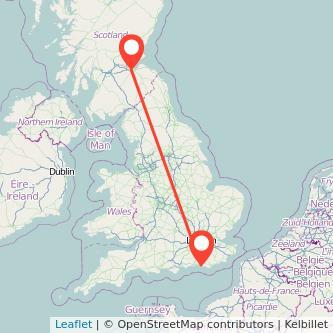 There are 376 miles between both cities and the average train duration connecting Brighton to Edinburgh is normally 6h40m. Travelling by train is normally the fastest solution to go to Edinburgh from Brighton, and it's also a greener option than taking your car or using the plane. Looking at our data, the best fare to travel by train in the next month is £50.00. This price is based on an adult ticket and does not include the money you can save with a railcard. Find the cheapest tickets to travel from Brighton to Edinburgh by train, bus, ride sharing and plane. The Prices for train tickets Brighton to Edinburgh tend to increase if you don't book early. Based on our data, if you purchase your ticket 3 days in advance, the price of the ticket starts at £63 whereas when booking on the day you're travelling, you will need to spend at least £105 for your trip. Thus, you will save 40% on the price of your ticket by buying your ticket 3 days in advance as opposed to on the day you're travelling. We compare train ticket for all major companies to travel between Brighton and Edinburgh by train and find the best prices for the coming days. Take a look at the prices of train tickets Edinburgh to Brighton and find the best deal for your outbound journey. The best way to pay less on your Brighton Edinburgh train ticket must be to have a railcard. While regional railcards exist in some areas, National railcards enable you to make savings on most rail fares across the United Kingdom. Everyone is eligible to at least one of the railcard, even non-UK residents. National railcards available: 16-25 discount card, Senior railcard, Two together discount card, Family and Friends railcard and Disabled persons discount card. For instance, train tickets from Brighton to Edinburgh cost on average £64.19 (1). When dividing £88 by £64.19 (£88/£64.19 = 1.37), you can see that after only 2 one way trips from Edinburgh to Brighton, the card will have paid for itself. The cost to buy a Disabled persons railcard is £20 while it will cost you £30 to have a 16-25, Two together, Family and Friends or the Senior railcard. All of them enable you to get a third off most adult fares for a complete year.